Semi-permanent coating that will protect and restore your automotive pieces for up to one year! The CarPro Cquartz DLUX Plastic and Wheel Coating is a semi-permanent coating that will protect and restore your automotive pieces. DLUX contains more than 50% pure silica. This high purity percentage ensures having the most transparent glass coating over the surface, high levels of water repellency and long lasting paint protection from dirt, road salt, ice, snow, and other environmental contamination. DLUX will also coat plastic and rubber while restoring faded pieces and providing a low-gloss, like-new factory finish. 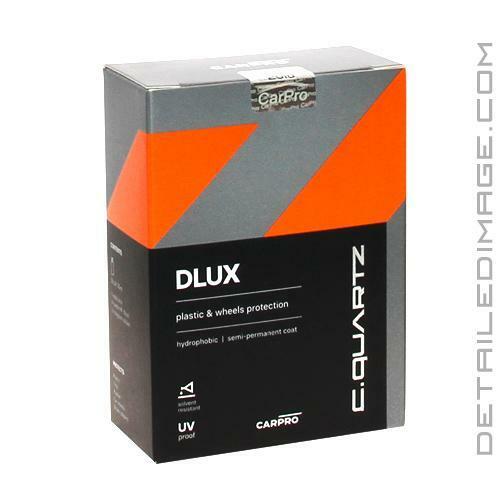 CQuartz DLUX forms an incredible bond with the surface it lasts for up to one year! Check out the application instructions below and make sure you clean the surface thoroughly before applying. Protect your wheels and restore your rubber and plastic with the CarPro Cquartz DLUX Plastic and Wheel Coating! Clean the surface to remove any oils and wait until the surface is dry. Wrap the blue sponge with a suede cloth. 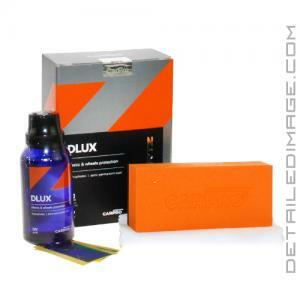 Pour a small amount (1-2 drops) of DLUX onto the suede cloth and apply. Let cure 1 - 10 minutes at 30 - 10 degrees C (86 - 50 degrees F), respectively. Use a clean auto detailing cloth or suede microfiber to wipe it off gently, in a circle motion, until no streaks are left behind. DLUX takes 1 - 3 hours to cure. Do not drive the car during this time. The water repellency improves with more cure time. Complete cure with NO rain takes about 24 hours. Any water marks created by rain must be wiped off during first 24 hours! CQuartz DLUX is a great option for any vehicle, with the ability to keep your wheels and trim protected for years rather than days or months! Clean the surface well, free from all oils. Let dry. Shake well. Pour a few drops on the suede wrapped applicator. Apply in a criss-cross pattern across the treated surface. Let cure: 1 min. ~ 5 min. at 30 degrees Celcius ~ 10 degrees Celcius respectively. Wipe off using suede MF. Full dry time with NO rain 24H. Any water marks during first 24H must be wiped off!